The majority of the comments that I read proves my theory that all liberals are not only mentally challenged but just plain sore losers. 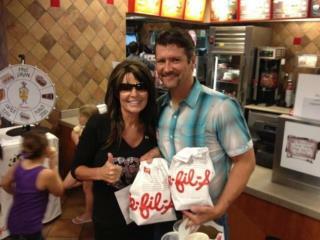 The Libs started bashing Chik Fil A and sent their business soaring through the roof and when a Former Governor tweets a photo of herself months after the original media hype while stating a fact, your choices are pretty limited in Alaska but the Libs that screwed up in reverse with this one and created a overnight sensation manage to find a way to name call and rant and rave about something that the media whore AKA in this case Polly Davis Doig has to stoop to the gutter level and write about this. Try writing about real news or have you forgotten how.More proof the Obama has declared war on America as he has taken control of the media as in time of war that is one of the first things you do. Please I beg all of you to step back and look at what is going on to this country America is turning into a society of College educated drones. A neat summary of Palin's career: http://www.youtube.com/watch?v=Kx4kXgF88wQ Cheers! A pea-brained VP candidate one minute, a pea-brained nobody the next. God Bless America!